African Martyr’s Day in Huntsville, AL. honored and Declared March 1st Mafundi Lake Day. It was February 21, 1965 that Malcolm X was assassinated. Malcolm was one of Africa’s greatest patriots in our struggle for liberation. We must hold up our heroes and heroines who selflessly lived and gave their lives for our liberation. The APSP declared February 21 to be African Martyr’s Day to raise up those who worked in the interest of the African working class for Freedom. 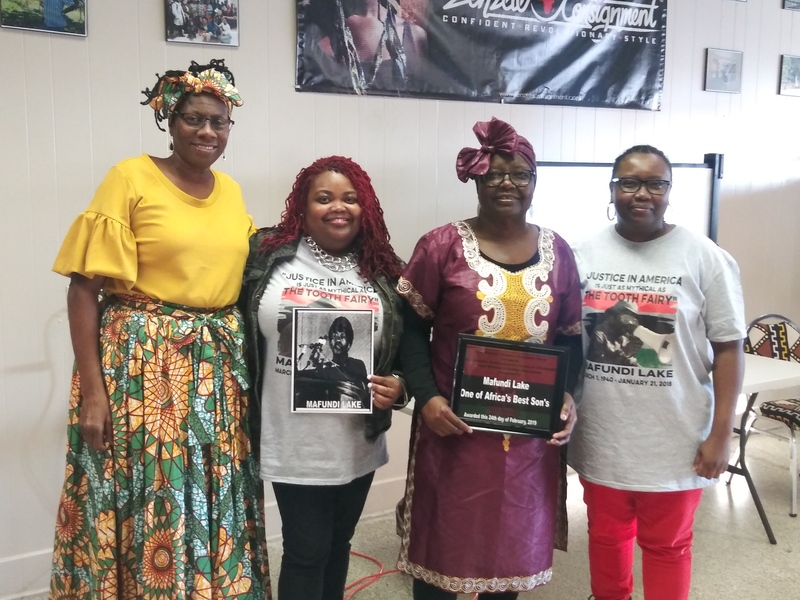 On February 24, 2019, the local Huntsville Unit of the African People’s Socialist Party had its African Martyr’s Day at Zenzele Consignment Shop to honor one of Africa’s most courageous soldiers, Mafundi Lake. Comrade Weyni gave brief commentary before each song bringing the crowd to tears. She discussed the Love Mafundi had for his people and his family. She reflected on how the Chairman of the African People’s Socialist Party (APSP) came to the aide of her family and Mafundi when he was incarcerated without hesitation. She said “this is when most others were just talking and asking questions”. She stated “It was like the Chairman just knew what to do, what we needed and made it happen. The program opened up with African Drumming by “The Tribe” a young African Drum Circle in Huntsville, AL. The African People’s Socialist Party introduced to Huntsville, Alabama who Mafundi Lake was, although some already knew of him. Mafundi’s boldness was noted and many Africans leave prison looking for the APSP because of the political education and organizing that Mafundi lead in the Alabama prisons. Mafundi Lake born March 1, 1940, passed away in prison January 21, 2018. Mafundi was a political prisoner for over 40 years but he never wavered. He was organizing to the very the end, his family with him every step of the way. The Chairman wrote in memory of Mafundi, “It is not often that one has an opportunity to speak well of the departed with honesty. Assata Lake, Mafundi’s daughter spoke briefly after the crowd pushed to hear from the family. She stated, “We thank the African People’s Socialist Party for honoring our father. Maia my sister is Chairman Omali’s goddaughter. “I appreciate this event because we don’t get out much but this makes me feel like we have to be more involved. We don’t feel like we missed out on anything while our father was locked up because he was always there. The APSP presented the family with the lifetime achievement award of courage, high morale and high discipline to Mafundi Lake. The Regional APSP and Local Unit passed a resolution that declared March 1 Mafundi Lake Day. The Southern Region of the APSP and the family projected to build a great Mafundi Lake Day on March 1, 2020 in Birmingham, AL—Mafundi’s hometown.